You may not have seen this pest. It is tiny, but the damage is very evident. Unfortunately it’s likely you won’t notice it until the pest numbers have reached epic proportions. 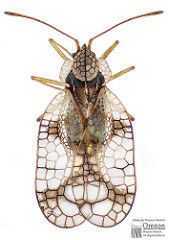 It is hard to find advice that does not involve using a lot of toxic chemicals, so this is a welcome article on Safe pest control for the azalea lace bug . I would just add that the softer treatments recommended are excellent, but you MUST be thorough because they normally work by contacting the insect, which means carefully treating the underside of EVERY leaf and being persistent to catch the escapees. And keep lots of water and nectar around for beneficials. Herbs like cilantro, Italian parsley and yarrow are particularly helpful. A nice ocean spray (Holodiscus discolor) would attract a boatload of beneficials and it loves the sun and heat we are having this year. Do wait to plant shrubs and perennials until the falls rains begin though. Previous PostBotanical Rambles Blog Discusses Native Plants for Covering GroundNext PostGo Trees – Fight Bugs! !